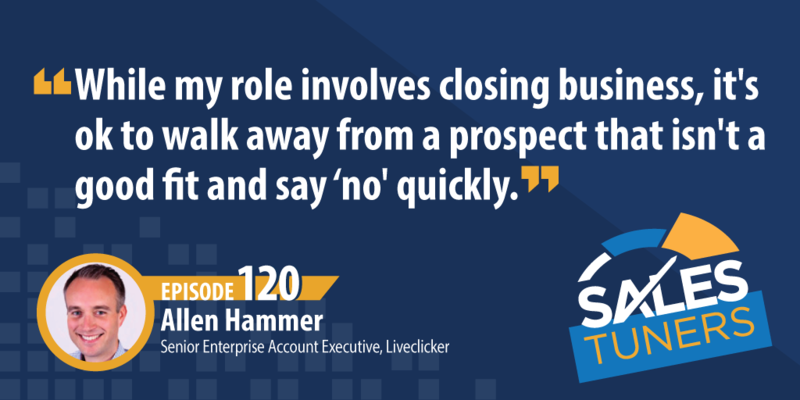 Allen Hammer is an enterprise account executive at Liveclicker, an enhanced email personalization platform that uses real-time data points to customize user experience. Having served as an individual contributor for 15 years, Allen has more experience than most managers. His sales career started way back as an enterprising 6-year-old boy. After moving to a new neighborhood, he made friends by going door-to-door selling a wagon -full of colored rocks he’d collected at the local pool. He ended up making a nice little profit (and some friends). Despite his natural sales talent, Allen has faced his fair share of struggles—alcohol being one of them. Listen in to hear him open up to share what his battle with alcohol taught him about success in sales—and in life. Disqualify Early: If you want to save both yourself and your prospect time, then it’s your job to disqualify them as early as possible. Now, if you have a weak pipeline or don’t like prospecting, I know you will hang on to every opportunity like it’s a bar of gold, but it’s likely costing you. Instead of trying to figure out every possible way your product could work for them, focus in on the two or three things that would make it not a fit, and be transparent about it. Doing this will allow you to spend more time working deals that can actually retire your quota and earn you a commission instead of promising your VP that the deal will come in. Pick Your Path: If you are a star in sales and find yourself regularly hitting or even exceeding quota, don’t think that the only next step for you is to become a manager or even VP of sales. The skills you need to train, manage, and get the best out of other reps is completely different than the skills you’ve worked hard on developing. Additionally, more often than not, you’ll also take a pay cut in order to get those new found responsibilities. You Don’t Have to Be the Best: In the ’80s, the car rental company Avis rolled out a brilliant ad campaign claiming to be #2 behind Hertz and claiming “we try harder.” How many times have you claimed your product or service to have the best this or the greatest that? Here’s the deal, it’s annoying as hell and is often met with an eye roll you can’t see. Plus, how do you know? Because your marketing department told you so? Instead of leading with arrogance, acknowledge that there are other solutions out there and your goal in the conversation is to determine the reals needs of the prospect and promise them you’ll try harder.